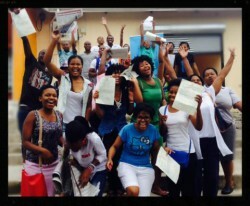 IkamvaYouth learners are celebrating great matric results; once again these township youth have achieved results that far surpass the national averages, showing that the odds can indeed be overcome. Matrics from nine branches across five provinces achieved an overall 82% pass rate, with 87% of those eligible for tertiary study (51% bachelor and 36% diploma). The class of 2014 are going on to study a range of important fields that will equip them with the skills they need to build South Africa, including medicine, speech and audiology, social work, biomedical science, town management, civil engineering, mechanical engineering and information technology to name just a few! IkamvaYouth’s work with the class of 2014 is far from over. While many of those who passed have already been accepted by the country’s top universities, there is still work to be done to ensure that none of the class of 2014 become NEETs (not in education, employment or training). Most of the learners who did not pass are eligible for supplementary exams, and IkamvaYouth will be supporting these learners to ensure that they are well-prepared to clear this hurdle on the way to securing post-school opportunities. IkamvaYouth has maintained a matric pass rate of between 82 and 100% each year since 2005, and true credit for these results must go to the learners, volunteers, the staff, partner organisations and donors. “IkamvaYouth would like to shout out particular thanks to IkamvaYouth’s five largest donors in 2014: Amalgamated Beverage Industries, Omidyar Network, Capitec Bank, the Stars Foundation and the TK Foundation. Without these and all of the other wonderful donors, these results would not be possible. We hugely appreciate your support and are looking forward to continuing to working with you in the years to come,” said chairperson Leigh Meinert.